The world around us is burgeoning – daylight saving time has given us more sunny hours in our days, Spring has brought new color to our landscapes, and the celebration of the resurrection of our lord Jesus Christ is only days away. All of these things came about with much contemplation, patience and hope. Many people think of the Lenten season as a time to deny themselves from something; to empty themselves so they can be replenished spiritually is a humble act that helps us individually. But I like to consider another aspect of Lent that can fulfill a person’s spirit just as much: helping someone else. When I study on Isaiah’s words, it reminds me of Jesus Christ’s entire ministry: to love one another. As simple as that statement is, it encompasses everything he demonstrated in his life: bringing justice to the marginalized, giving hope to the poor, encouraging love among all people. He showed how a few fish and pieces of bread could feed thousands simply by sharing what one has with someone who has nothing. I can think of no better way to celebrate his teachings while filling your own spirit than to help someone in need. Methodist Family Health has just such a way to do this. 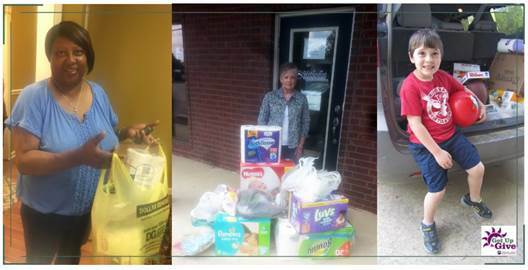 The 10th Annual Get Up & Give collection project takes place throughout the 40 days of Lent, and Arkansas’s United Methodists can contribute to children and families who are abandoned, abused, neglected and managing psychiatric, emotional, behavioral and spiritual issues. Both children and adults can participate by donating personal hygiene items, clothes, shoes, school supplies, bedding, funds and other necessities. T he mission of Methodist Family Health is to provide the best possible care to those who may need their help. Many of the children in their care are in the foster care system or have families with few monetary resources. By providing them things like new underwear, deodorant, their own school supplies – even books and toys – demonstrates to our neighbors that someone they have never even met cares about their well-being. The simple act of giving to those who have nothing brings justice to the marginalized, hope to the poor, and love to us all. Regardless of how you renew your spirit, remember to do justice, show compassion and love without limits.